Festas Juninas, or the June Festivals, are now taking place in Brazil once again. As we explained last year in our posts on Pamonha Cake and Munguzá Doce or Canjica de Milho (Sweet Corn-Coconut Pudding) during this month Brazilians essentially celebrate the abundant corn harvest while thanking St. John for the rain. We also drink quentão, the typical beverage of these festivities…Quentão is precisely our recipe for today. As I child, I always eagerly looked forward to participating in Festas Juninas every year. Festas Juninas were and still are one of my favorite Brazilian celebrations. The excitement of this tradition is something that I am trying to pass on to my children, as you will see below. Since we are planning to visit Brazil next June, they will finally have the opportunity to experience these festivals more fully than just enjoying corn dishes and dressing up as matutas (hillbillies)… I hope that they are enchanted by the sky lanterns, showers of fireworks, and bonfires just as I was… I hope that, just as I did when I was a girl, they get to dance quadrilha folk dances under an arraial (huge event space brightly decorated with strings of colorful flags and paper balloons, and filled with tents or rough stalls)… I hope they don’t mind listening to a few quirky superstitious rituals called simpatias which are carried out by single ladies in order to catch that special someone — although they are not yet at the age for that, fortunately. I don’t believe in simpatias, but I have a lot of fun listening to them. 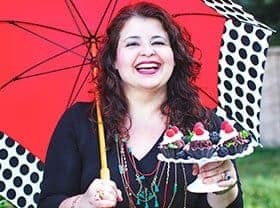 I am sure that they will be able to recognize and appreciate many of the corn dishes that they will encounter there, such as sweet popcorn, canjica nordestina or curau, pamonha (pronounced pah-MOH-nyah), mungunzá doce, Brazilian cuscuz, fubá cake, as well as our treat for this year: Quentão, which can be translated as “Big Heat”. Before someone accuse me of serving alcohol to my children, I have to explain that quentão de vinho is suitable for children because all the wine alcohol content will be evaporated during the boiling process. If you wish, you can use grape juice instead of red wine. Quentão de vinho or Brazilian mulled wine consists basically in a heated mixture of red wine, ginger, sugar, and spices such as cinnamon and cloves… Well, at least in southern Brazil where the largest production of wine is located. In northeastern Brazil, quentão is made from cachaça instead, a distilled alcoholic beverage made from fermented sugarcane juice. For this post, we are making quentão de vinho or Brazilian mulled wine as I said earlier. Place all the ingredients into a large saucepan and bring to a boil over high heat, stirring constantly just until sugar has dissolved (about first 2-3 minutes of heating). Let boil for additional 10 minutes. Strain and serve warm. Garnish as desired. 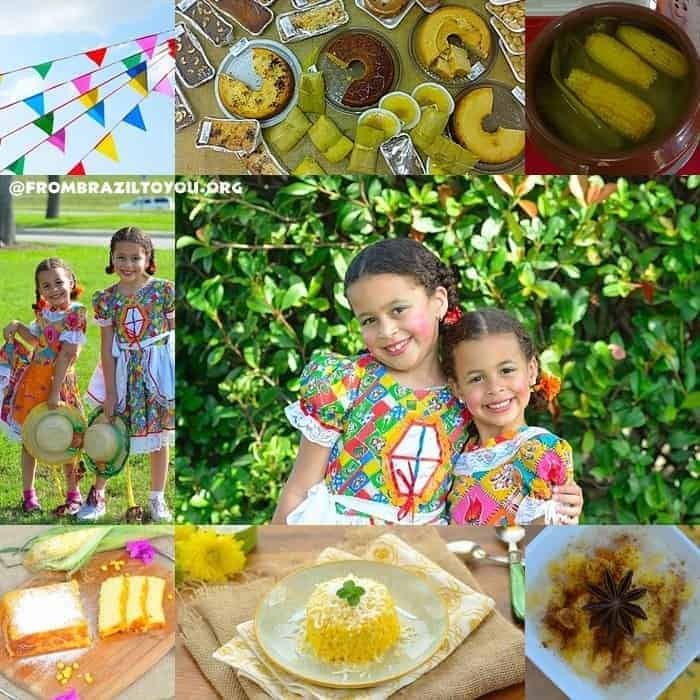 ** A big thanks to my friend, Ana Caldas Maciel, for having taken two of the pictures above and sent them to me to be featured in this post: Boiled corn on the cobs and Table with several corn treats such as pamonha, canjica or curau, and cakes. This looks like a wonderful tradition and such a joyful celebration! It’s fantastic that you pass on this Brazilian tradition to your children. Thanks, Daniela! They really enjoyed dressed up as hillbillies and eat some of those dishes. Pede ele pra ler, Sally! Denise, you’ve painted a lovely picture, I want to go with you. I love traditions like this which create such wonderful memories. I’d love to sip a glass of your Quentão de Vinho and enjoy the festivities! I wish you could come to Brazil with us, Chris!!! You’d love Festas Juninas. Cinnamon and cloves makes everything delectable! YUM! Thanks for stopping by, and have a blessed trip to Japan, Nami! See ya. What a wonderful summer celebration! 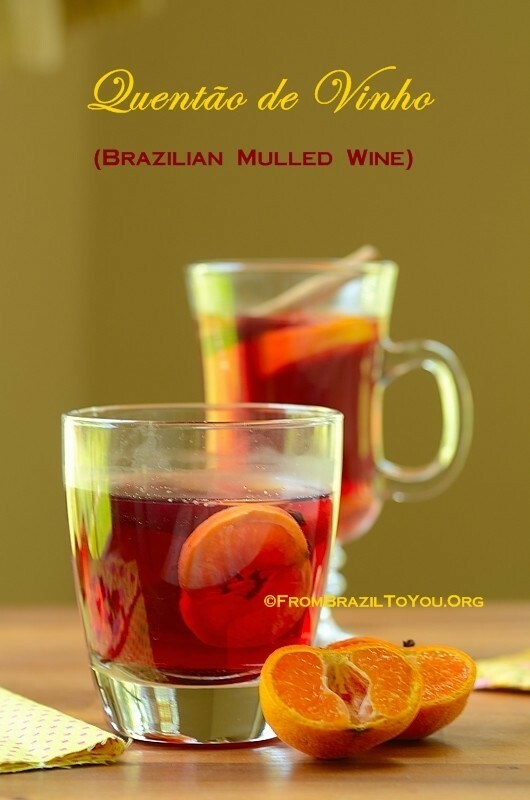 And Brazilian Mulled Wine with cinnamon and ginger sounds tempting! Deb: Even my children drank it and absolutely loved it! My husband is now in Brazil. Hi, Amber! Thank you very much. This is a great drink. When you do have a chance, please try it (maybe in the fall/winter?). Wishing your husband a great time there although things have been rocky in Brazil because of the protests. Have a nice weekend! Spices and Wine…that sounds awesome! What a lovely celebration Denise. And those colours are to die for. Loved your post! It is my way to make them experience Brazil and its culture since we are far from there and don’t get to go so often. Thanks for stopping by, Raymund! Grandmothers are blessings in one’s life. I miss mine! 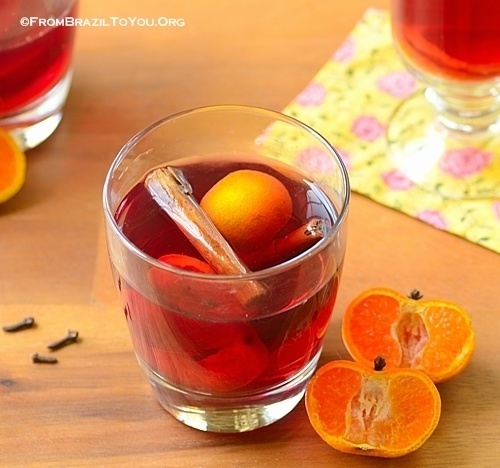 So, it’s like a hot sangria…I like it, specially because we already started winter so comes perfect for cold nights. You are right, Nydia! It is like a hot sangria. I love this!!! Gimme a glass…or ten! 🙂 And I LOOOOVE that you shared so much with us about your heritage. I want to go to Brazil! Thanks, Kate! This festivity is one of the best that we have down in Brazil. It is full of life and colors, the corn dishes are exquisite, and the square dances are quite fun. I wish one day you will be able to experience that. Your girls are adorable! And I’m certain they will remember all the special foods and traditions your share with them. Your wine sounds amazing! Have a lovely week my dear!